Our Artic Armor Silver cover has all of the strength and durability to ensure years of winter protection, Heavier woven polyethylene scrim and coating make our Silver grade cover strong and able to withstand wind. sleet and snow. The cover is UV stabilized to protect it from the harmful effects of the sun, It feature a black underside to retard algae growth and sealed seams to ensure a crystal clear pool next spring. Our Silver cover comes with loops every four feet to secure water bags and corner grommets allow for extra tie down in windy areas. 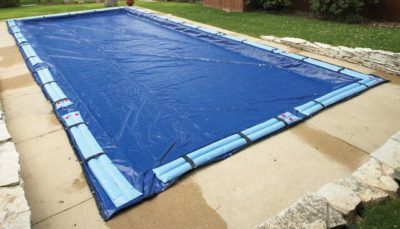 The cover is 5 feet longer and wider then the pool size and it is backed by a 12 year warranty (2 years full rated).